My book report on Social Networks and Organizations, by Kilduff and Tsai. Part Four of a Series. Chapter Four: Bridging the gap between structuralist and individualist approaches to social networks. Kilduff and Tsai shine an unflinching and highly amusing light on this seemingly religious rivalry--another good case study for Bion and Shirky. This chapter, in my opinion, is the single best chapter of the book and all by itself justifies the book's $45 purchase price. Kilduff and Tsai show us the soap opera of real science. In this episode, individualists have thrown down the gauntlet and decried "the tendency in network analysis towards 'overelaboration of technique and data and an accumulation of trivial results.' (Boissevain)"
In response, "Network researchers tend to be united in their adherence to ... the anti-categorical imperative. This imperative, 'rejects all attempts to explain human behavior ... in terms of categorical attributes of actors.' (Emirbayer)"
Kilduff and Tsai go on, "The typical start to any social network article often involves a ritualistic swipe at those who have previously focused on the attributes of individuals." After showing us the soap opera, the authors conclude: "There is a pressing need for non-dogmatic research that explores issues concerning how individual differences in cognition and personality relate to the origins and formations of social networks." Kilduff, M. and Krackhardt, D. 1994. Bringing the individual back in: A structural analysis of the internal market for reputation in organizations. Academy of Management Journal, 37:87-108. Krackhardt, D. and Kilduff, M. 1999. Whether close or far: Social distance effects on perceived balance in friendship networks. Journal of Personality and Social Psychology, 76:770-82. Kumbasar, E.A., Romney, K. and Batchelder, W.H. 1994. Systematic biases in social perception. American Journal of Sociology, 100:477-505. Mayhew, B.H. 1980. Structuralism versus individualism. Part 1: Shadow boxing in the dark. Social Forces, 59:335-75. Mehra, A., Kilduff, M. and Brass, D.J. 2001. The social networks of high and low self-monitors: Implications for workplace performance. Administrative Science Quarterly, 35:121-46. Physicists, sociologists, and network gurus of all stripes engage in these behaviors as much as anyone. For all its brilliance, Shirky's essay suffers major flaws. 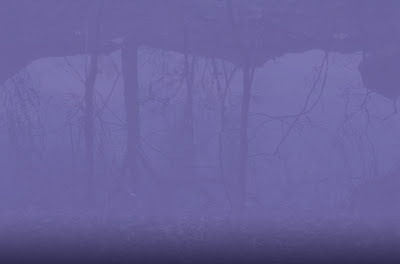 He argues that "learning from experience is the worst possible way to learn something." I refer readers to group behavior pattern #1 for my first counter-example to this bizarre claim. Shirky also says, "Prior to the Internet, the last technology that had any real effect on the way people sat down and talked together was the table." By my estimation, the table pre-dates literacy, and so Shirky is ranking broadband access as more significant to talking than both reading and writing. Does that sound right to you? I hope that my readers will check out Shirky's highly stimulating essay and come back to Connectedness for when I argue that the very title of his essay, "A Group Is Its Own Worst Enemy," is as problematic as the above two quotes. "Science has ceased to be the occupation of ... ingenious minds supported by wealthy patrons and has become an industry supported by large industrial monopolies and the state. Imperceptibly this has altered the character of science from an individual to a collective basis, and has enhanced the importance of apparatus and administration." Click on the picture to see the full map. The moment I saw this map it reminded me of Katy Borner's work at Indiana University, which is part of the traveling exhibit, "Places & Spaces: Mapping Science." This exhibit includes a "Map of Scientific Paradigms" by Boyack and Klavens: What important information about "Science" is communicated by these outstanding maps? There is no simple answer to this question. For me, the most important information a map can convey is a sense of which places are close together and which are far apart. 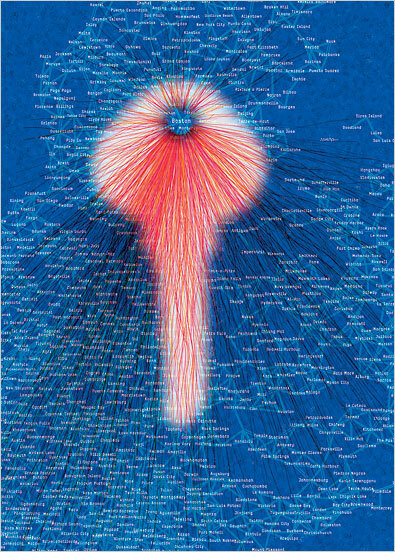 Others design their network visualization tools based on different priorities (e.g., NetViz Nirvana by Shneiderman and Aris). Even better, here is a slide show with MIT Media Lab's John Maeda telling how he came up with the design, which he originally conceived as "Google mappish Mondrian. Sort of Pollack meets Mondrian." 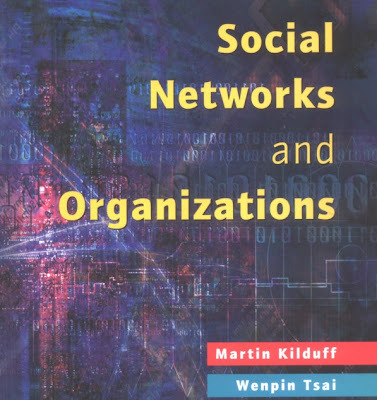 My book report on Social Networks and Organizations, by Kilduff and Tsai. Part Three of a Series. Chapter Three: Is There Social Network Theory? Kilduff and Tsai acknowledge this obtuse yet persistent question and explore the theoretical foundations of SNA. Kilduff and Tsai lose me at this point in their book by being a bit too earnest in their treatment of this question. My objection to their earnestness has little to do with SNA and more to do with asking of anything, "Is this a method or a theory?" Using a favorite SNA metaphor to illustrate my point, imagine a serious conversation debating, "Is x-ray imaging a method or a theory?" This is a pragmatic question for academics deciding whether to grant PhDs and other awards to those working on x-rays. For the rest of us, who cares? I just want to know when x-rays are helpful and when they are not. My personal favorite example of this sort of question is counting: "Is counting a method or a theory?" Most of us experience counting as a useful but humble technique, or method. But any fan of Georg Cantor can tell you that counting is also an extremely subtle realm of profound theory. Less mathematical readers may better identify with this example: "Is language a method or a theory?" If you're like me, this is a fuzzy question because we are equally bad at appreciating illiteracy (experiencing language as method) and Noam Chomsky (understanding language as theory). I think one reason SNA battles the method vs theory question so hard is because its devotees are still trying to find a home. 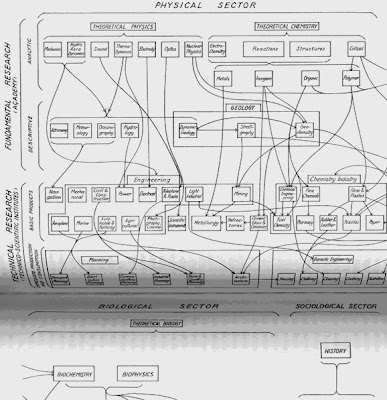 Just look again at this picture of "web science" by Tim Berners-Lee and you can see how this proposed paradigm has no single foundation from which to proclaim its theoretical rigor. To my eye, the picture has so many overlapping fields that it actually detracts from Berners-Lee's intention to create "web science." Burt, R.S. 1992. Structural holes: The social structure of competition. Cambridge, MA: Harvard University Press. Granovetter, M. 1973. The strength of weak ties. American Journal of Sociology, 78: 1360-80. Granovetter, M.S. 1985. Economic action and social structure: The problem of embeddedness. American Journal of Sociology, 91: 481-510. Monge, P.R. and Contractor, N.S. 1999. Emergence of communication networks. In F.M. Jablin and L.I. Putnam (eds), The new handbook of organizational communication: Advances in theory, research, and methods, pp. 440-502. Thousand Oaks, CA: Sage.